Well, I through out a challenge in last week’s entry and the powers that be sure stepped up and answered it! 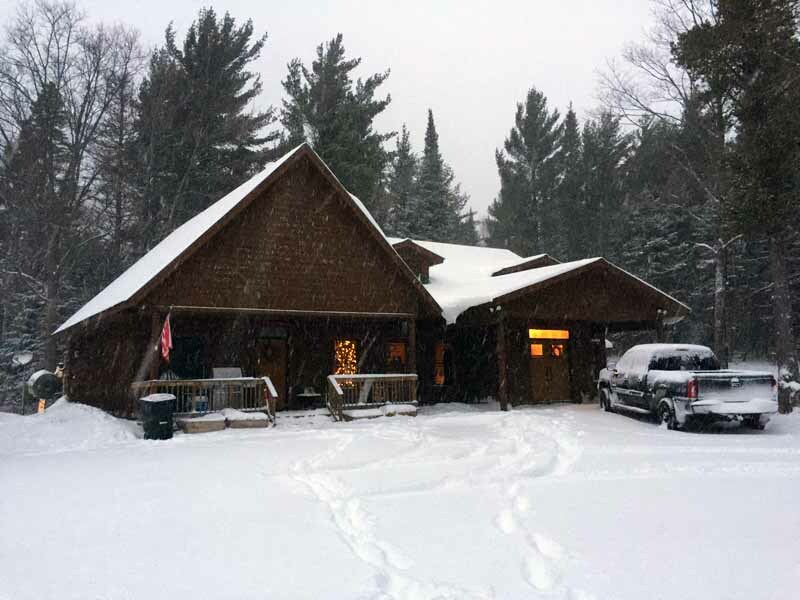 Since I last wrote, we have picked up 36″ of snow and it is currently snowing as I type. Talk about making up for lost time! If that were not enough, there is the realistic possibility that similar totals could fall in the next 7 days. The pattern is locked and loaded and does not look to let up for more than a day or so. What makes things even better is that we are not the only ones getting the snow. By the time I finish typing this entry, just about everyone north of I-80 will have white on the ground. Plus, many of the areas north of I-80 will get more snow this coming week, perhaps a lot more in some spots. My only concern is for areas like eastern IA, northern IL, southern WI and sections of lower MI which could be on the warm side of the storm at the end of the week and thus see rains fall first, with things finishing up as snow. I guess the trade off to that is the fact that much of the areas of northern MN, northern WI and even northern lower MI that need lakes and swamps to freeze up have been seeing that occur since late last week and will see more of it this week before potentially getting a lot of snow. I have so many friends/customers that rely on the snow being down to allow snow play to happen, it really makes me feel good that we had such a nice change in the weather pattern to one that wil make so many happy. I most certainly cannot forget about all the good folks that will be able to take part in the snow play. It’s been a while since so much of the upper Midwest had good conditions for snow play between the Christmas and New Years holidays and barring a major change in the going forecast, it looks like all areas north of a line from the Twin Cities to Wausau WI to Bay City will be in good shape. So that was the forecast, now to recap the week in the Keweenaw. We picked up some snow late Sunday into Sunday night, which left us with a pretty solid snow pack to start the week, although it was a very wet and heavy snow. By Tuesday, confidence was growing that the seasons first significant round of lake effect snow would set up for the second half of the week and things at Snow Central really started to buzz. Well, had they known what was to come, they would have been excited, but that is one of the beauties of a dog, they live in the moment… Not the past, not the future. So they were chilling, but things were getting busy in the office. Typically the duties associated with the site ramp up once the first meaningful snows fly, which is usually in November. So this season it did not happen until this week, but just like the snow, it came. Wednesday night the lake snows started in earnest and we awoke to around 10-11″ new by Thursday morning. As is almost always the with lake effect snow, the totals were not uniform with the activity late Wednesday into Thursday morning. We actually had some of the heaviest totals, with some areas seeing less than half of our 10-11″. With a bit of a lull in the action, I headed over to clear the snow off the outdoor ice skating rink in Ahmeek Location. It was quite the chore, as there was about an inch or so of very slushy snow underneath the 10″ of fresh that we had picked up Wednesday night and early Thursday morning. 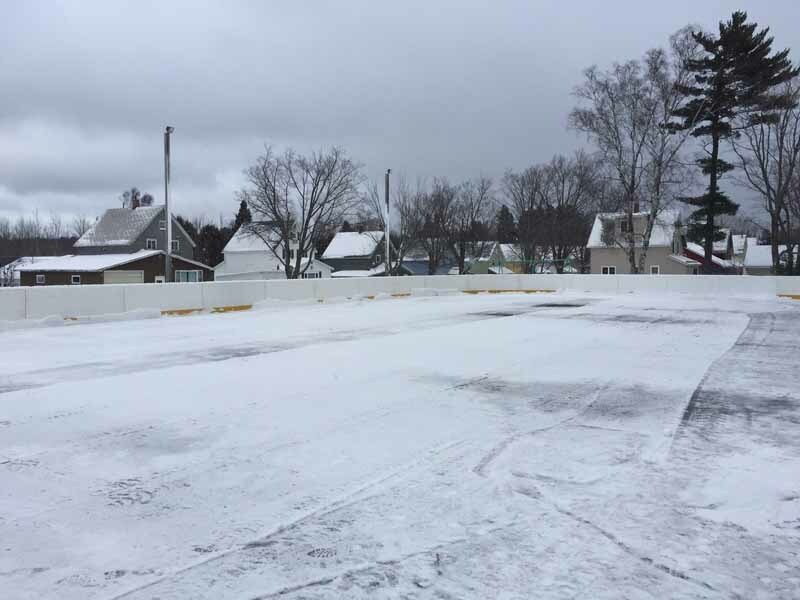 So Big Red really had to work hard to move the slushy stuff, but was able to manage it and by the late afternoon, the rink was cleared of most of its snow. It was already pretty cold out, but the new snow was doing an excellent job of insulating the slab and the wet snow from earlier in the week. By the time I finished up, some of the areas first cleared had already frozen up. They have not flooded it yet, but the slab really needed to be exposed to the elements and left to freeze up. It did continue to snow the rest of the day on Thursday and into Thursday night. Not too heavily in most cases, but as much as 5-6″ fell in areas to the south of Houghton. We picked up around 4″ new snow Thursday and Thursday night and it was almost looking like the main snows might be winding down. But the winds, the cold air and the big lake had different plans. Soon after the girls headed to school Friday morning, the intensity of the snow picked up and it kept up at a very healthy clip most of the morning. Here is a shot soon after sunrise when it had just started to snow more heavily. 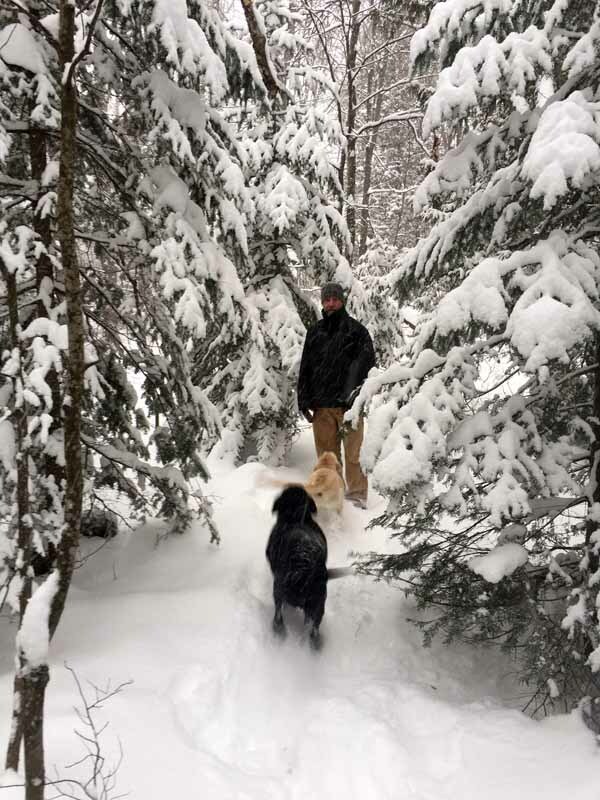 With the snow dumping and not a lot of wind, plus temps in the upper teens to low 20’s, Jim and I decided it would be a great morning to head out in to the woods with the pups and go for a snowshoe. 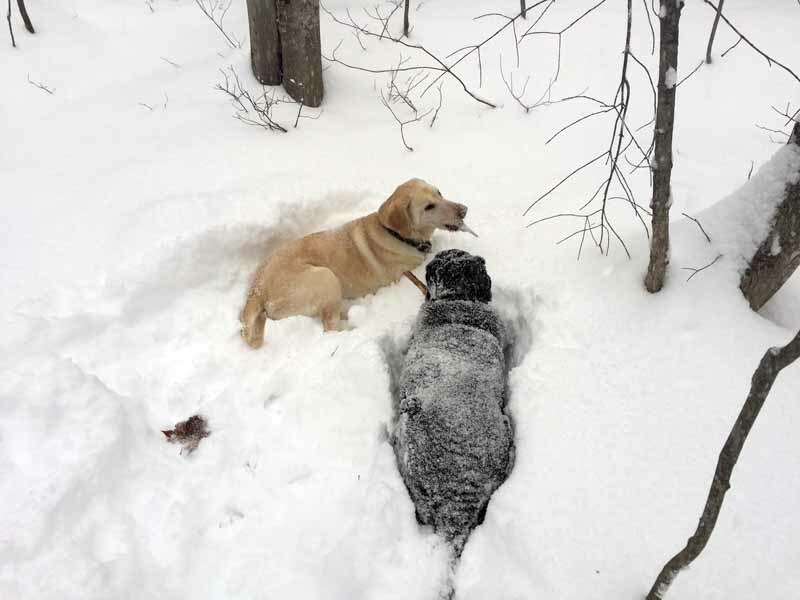 The pups and I had been out earlier in the week a few times and the woods were very beautiful with the wet and sticky snow, but did not need snowshoes. 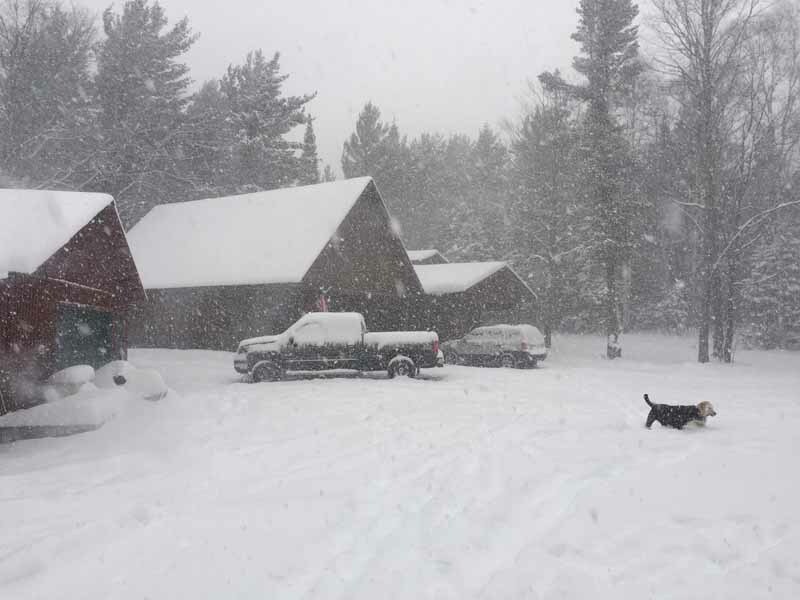 By Friday morning, there was about 14″ of snow on the ground, which was plenty enough to warrant the need for snowshoes. The fresh snow and heavy falling snow really made the woods a winter wonderland. 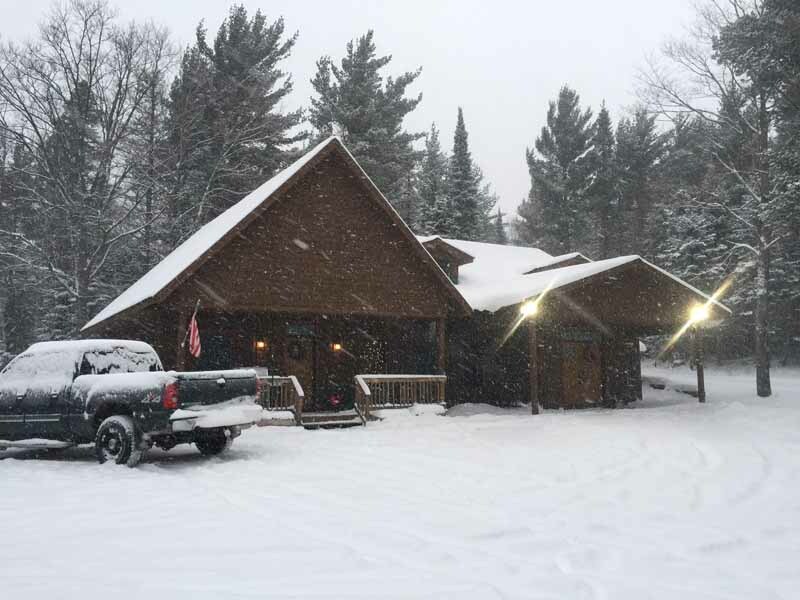 My brother Jim even commented on how when he was a kid, he always dreamed of a scenario like that and had only been able to experience it a few times in his entire life and here he was, experiencing just the start of his first Keweenaw winter and was already living out the dream. It helped to remind me of how lucky I am to live here and be able to live out my snow-dreams so many times each season. Of course the pups where in their element. I do not know if they dream, or if they do, what they dream about, but it did not matter. 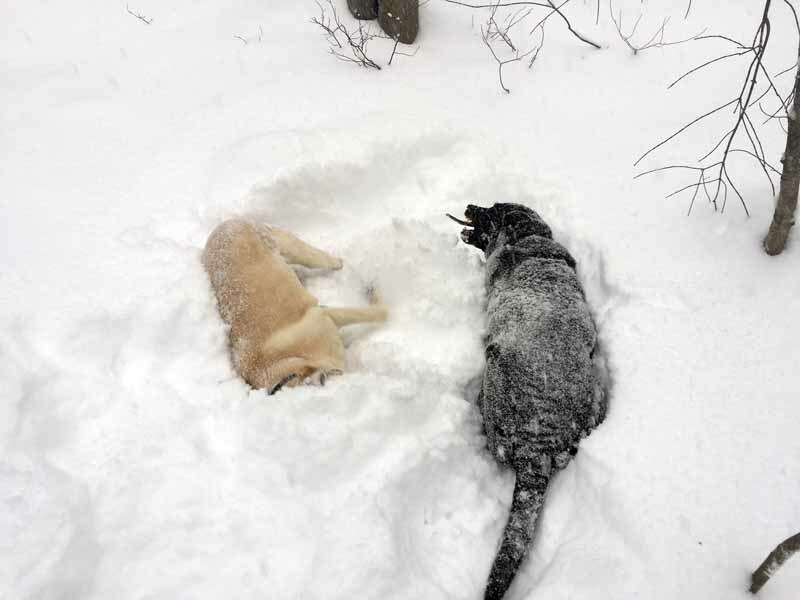 They were like two kids playing in the snow. Running around and chasing each other through the woods. Dodging and darting around trees and occasionally picking up a stick and chilling out so they could chew on it for a while. Millie even decided to make a snow angel. By the time we finished up with the snowshoe, a couple of fresh inches of snow had fallen and it was still falling at the rate of 2-3″ per hour. We ended up getting around 7″ of fresh snow from 8 until 11 am Friday and then went back to a more garden variety of snowfall. Nora’s nephew was graduating from Northern MI University this weekend, so once the girls got back from school, we packed up and headed to Marquette for the weekend. It appeared as though the heavier snows were over and the NW winds would be shifting more to the west, which would cause the snows to concentrate across the Keweenaw, but leave the rest of our drive from around Chassell or Baraga to Marquette pretty snow free. Once again, the powers that be had a different idea. We did have fairly light snow down to Houghton/Hancock and then to Chassell, but soon after Chassell, we hit a white out. 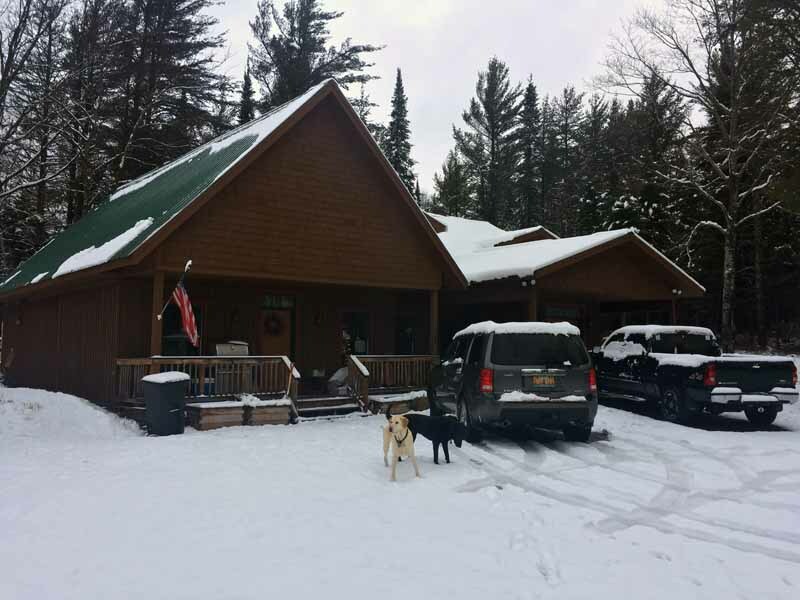 Luckily, the snows did let up by the time we go to Baraga and we even saw a few stars out. Little did we know that the band of heavy snow we drove through would move north with the change in wind direction and the proceed to park itself across the Calumet area for most of the night. I did check the AL Cam and Woods Cam from time to time Friday evening and then Saturday morning and had seen that considerable snow had fallen at our house, so I called Jim (who was house/dog sitting) to see what the result was. He told me that they had picked up around 8-10″ of fresh overnight. Then the reports of what had happened in Calumet overnight started to hit the wires of social media. Nora started showing me pictures of the snow from Calumet and the stories that some of her friends had to tell and it was pretty incredible. 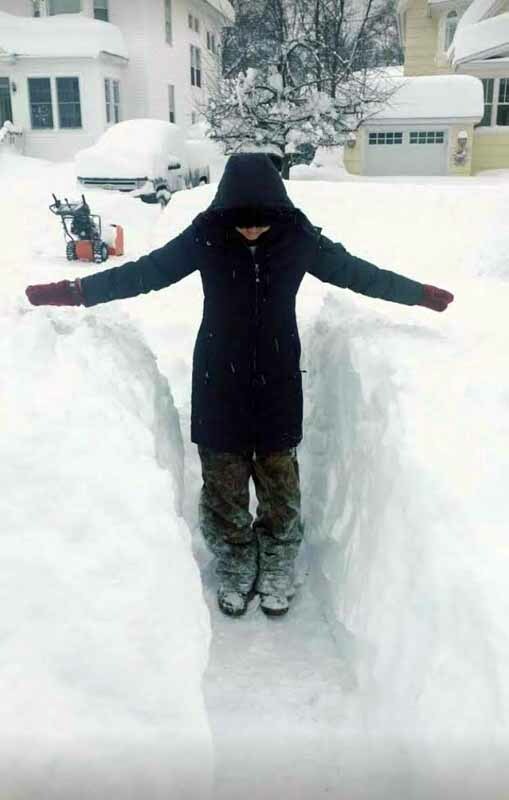 Depending where you were in Calumet, you picked up 2 to 3 feet of snow overnight Friday night! 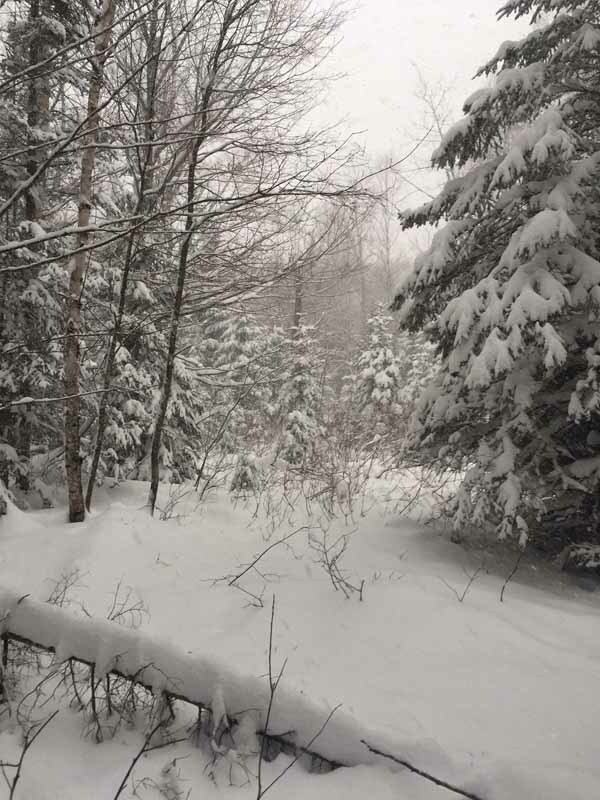 It takes a lot to cancel things in the Keweenaw due to winter weather, but many of the activities planned for Saturday in Calumet had to be postponed or canceled so that they could dig out. We were not in town to be able to capture things, but I did get a few pictures sent to me of the snows. Here is one of them digging out from the heavy snows. No that was not a child, it was an adult. 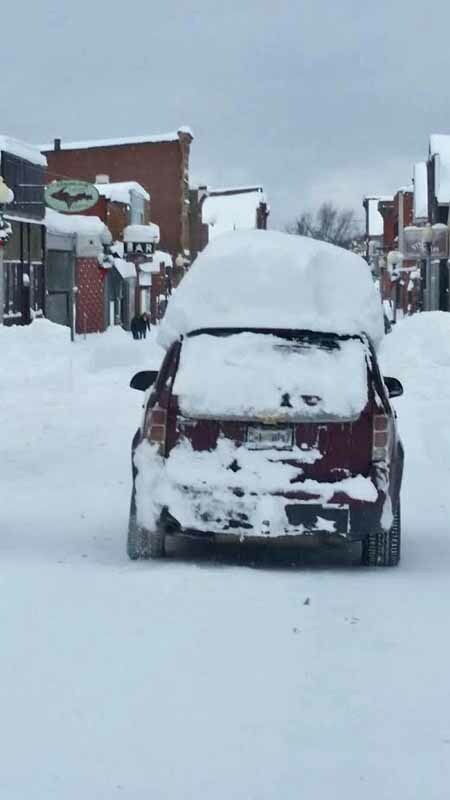 Jim sent me this one of a vehicle traveling down the road with a thick cap of snow on the roof. Probably not the best clearing job, but still made for an interesting photo! So I guess that covers it for this one, but it promises to be another snowy week, perhaps even more snowy than we just went through. Only time will tell, but I am going to go out on a limb and predict a White Christmas for the Keweenaw in 2016!